The 76-year-old former military leader won office in 2015 on promises to improve Nigeria's oil-dependent economy, fight rampant corruption and quell insecurity — especially in the northeast plagued by Islamist extremists. 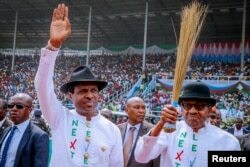 Nigeria's President Muhammadu Buhari, at right, greets supporters during a campaign rally in Rivers State on Feb. 12, 2019. He seeks a second term in the election Saturday. 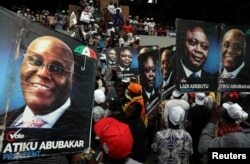 Buhari's main challenger — in a field of at least 60 contenders — is Atiku Abubakar, a 72-year-old businessman and former vice president campaigning on a similar platform. Supporters of the People's Democratic Party (PDP) attend a campaign rally in Lagos, Feb. 12, 2019. But another issue looms over the vote: election-related violence. Last Sunday alone, five people were fatally shot near the southeastern city of Warri in what local police attributed to political divides, the AFP news agency reported. The shootings had followed clashes between young supporters of Buhari's ruling All Progressives Congress (APC) and the main opposition People's Democratic Party fronted by Abubakar. "Violence is the major problem of every election," said Patricia Onoja, a 60-year-old retired nurse in Abuja, the capital. She told VOA she counsels young people to resist any thuggery – a mission undertaken by other Nigerian parent groups, too. Now, the country will be tested on whether it "can successfully conduct two consecutive, credible elections," says Oge Onubogu, an Africa program officer with the United States Institute of Peace. A U.S.-born Nigerian-American, she closely follows the elections. Nigeria's Independent National Electoral Commission (INEC) says it's prepared for Saturday's vote, despite troubles such as a suspected arson fire at its annex in the Middle Belt city of Jos. Clement Nwankwo, a lawyer and convener of the Nigeria Civil Society Situation Room, said that umbrella group has built "a good relationship" with the INEC. Nwankwo said the Situation Room has trained monitors and will relay any concerns – from missing elections materials to allegations of abuse – so INEC can address problems quickly. "We're able to intervene," he said. Buhari, in a late-December interview with VOA at the presidential villa in Abuja, said Nigerian security troops had reduced the amount of territory controlled by the Islamist extremist group Boko Haram in the country's northeast. "Now you can check in the northeast that Boko Haram is not holding any local government, per se," he said. But a decade after their emergence, the Boko Haram militants have kidnapped hundreds of people – most notably girls from a school in Chibok, many of whom still are missing. They've also killed tens of thousands and displaced millions. And now an offshoot group, the Islamic State West Africa Province, has added to the destabilization. Abubakar blames the Buhari administration for what he calls Nigeria's "worst insecurity. … It was confined to the northeast" when Buhari took office but now has spread. John Campbell, a former U.S. ambassador to Nigeria and a senior fellow with the Council on Foreign Relations, edits the Nigeria Security Tracker. It maps reported violence around the country. He said he sees "no new ideas from either candidate about how to deal with Boko Haram, no real discussion about the much more broad-based security issues which now cover the entire country." Men stand near displayed merchandise for sale around the informal sector at the Wuse market in Abuja, Nigeria, Jan. 30, 2018. In interviewing Nigerians late last spring, the Gallup World Poll found the highest level of food insecurity in 13 years. Three out of five respondents — 71 percent — said they lacked enough money for food at times during the previous 12 months. “In terms of having money for food and shelter, things are as bad as they’ve ever been for Nigerians,” said Jay Loschky, the poll’s regional director for English-speaking Africa. Abubakar — who worked in customs and the oil sector,and founded the private American University of Nigeria — says he has the business acumen to help guide the economy and encourage job creation. 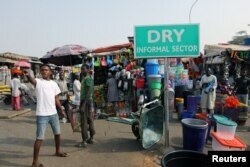 Job creation is critical, especially given Nigeria's huge and underemployed youth population. John Sunday, 23-year-old student and first-time voter, poses for a picture in the Makoko shanty town built on stilts in a lagoon in Lagos, Feb. 4 , 2019. "The private sector is not expanding. … I think that's the greatest problem we have in Nigeria," Tohomdet told VOA. "And the youth, of course, are frustrated." And vulnerable, he added. "They can be subject to manipulation and they could be used for antisocial activity. … It's not that they are not ready to work. The atmosphere is very tough." Last month, the president also drew condemnation — domestically and from abroad — when he suspended Nigeria's chief justice from the position where he would have a key say in resolving any election disputes. 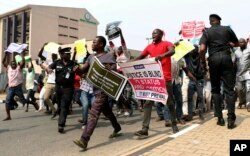 FILE - People protest at the secretariat of the Nigerian Bar Association following the suspension of Nigeria's Chief Justice Walter Onnoghen, in Abuja Nigeria, Jan. 28, 2019. The trial for Walter Onnoghen — who allegedly made false claims about his assets — is pending. Abubakar has encountered clouds of suspicion over time. As the BBC pointed out in a candidate profile last week, he was accused in 2006 of diverting public money toward "his business interests" while serving as vice president. A 2010 report from the U.S. Senate Permanent Subcommittee on Investigations also alleged that Abubakar was involved in bringing "suspect funds into the United States" through the bank account of his American wife. "Nobody has brought any evidence of corruption against me,” Abubakar said during his interview at VOA’s Washington headquarters. His two-day January visit to the United States — his first in more than 12 years — dispelled the Nigerian rumor that he would be arrested upon arrival. Instead, the candidate met with some members of Congress, the State Department and the U.S. Chamber of Commerce. Nigerians view the approaching elections with modest but improved confidence in the process, according to a Gallup poll released last week. Based on polling conducted in mid-2018, it found that roughly a third of respondents — 34 percent, up from 13 percent in 2014 — have faith in "the honesty of elections." By comparison, 49 percent of respondents in sub-Saharan African countries polled last year expressed confidence in their respective elections, said Gallup's Loschky. He also said 37 percent of Americans voiced confidence in U.S. elections. VOA contributors to this report include Grace Alheri Abdu of the Hausa Service, from Abuja; Peter Clottey of the English to Africa Service, from Lagos; Anita Powell, from Johannesburg; and Carol Guensburg, from Washington.